Mary and Dorset (in their vintage uniforms) were warmly welcomed at Bob’s Café American in Tuy Hòa, Vietnam. They were both very moved by this gesture, and enjoyed some terrific BBQ! 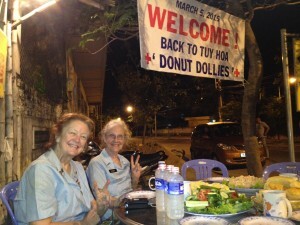 We are a little over a week into our trip to Vietnam with the Donut Dollies and things are going very well. We’ve met some wonderful people – both Vietnamese and ex-pats – who have been very welcoming and helpful on our quest. We’ll be sharing more photos in the days to come.